FRESNO, California -- The mother of the CEO of the ride-hailing company Uber died in a boat accident in a California lake, the company said. Bonnie Kalanick, 71, died after the boat she and her husband, Donald, 78, were riding in hit a rock in Pine Flat Lake and sank, Fresno County authorities said. 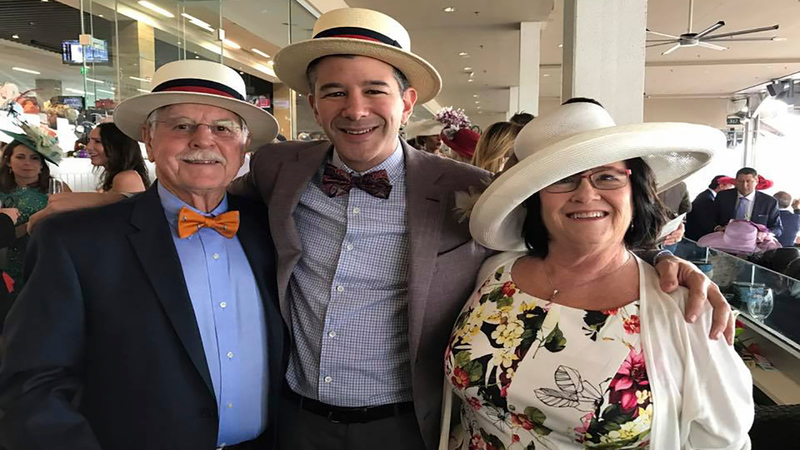 They are the parents of Travis Kalanick, 40, who founded Uber in 2009. The company has since grown to become an international operation with a market value of nearly $70 billion. The Kalanicks, from the Northridge neighborhood of Los Angeles, have been longtime boaters. In a memo to Uber staff, Liane Hornsey, the chief human resources officer, called the Friday evening accident an "unthinkable tragedy." She wrote that "everyone in the Uber family knows how incredibly close Travis is to his parents." Officers were called to the scene and found the couple on a shore of the lake, the Sheriff's office said in a statement. Bonnie Kalanick died at the scene, and her husband suffered moderate injuries, the sheriff's office said. An autopsy of Bonnie Kalanick is planned, the office said. Donald Kalanick is being treated at a hospital and is in stable condition, the company said. The couple's other son, Cory Kalanick, is a firefighter with the Fresno Fire Department.